Ok.. it seems that what I thought i understood about this, apparently I do not. 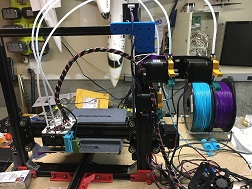 So i removed and re positioned the motors to this to keep the filament from dragging in the tube. That was all that was changed. I have tried to re level the bed using several different ideas. First layer has the same issues. 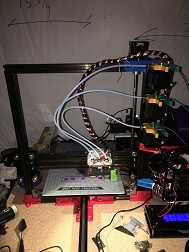 tried to calibrate the z-probe (this part has always seemed like black magic to me)...using the same 7 cm block and the instructions here "https://www.repetier.com/documentation/repetier-firmware/z-probing/"
From the instructions, i get that you lower the extruder close to the bed but before the sensor trips, get that number and raise the extruder until the block is just able to fit under the extruder and get that number, then using the calculations, you can determine what the offset is (but this does not seem to account for the probe at all since you are working with the extruder and not the probe). Then for the the bed auto-level, I understand that the points that get measured are in relation to the probe, and that the probe offsets need to be identified in the firmware so the machine knows that when it prints, the bed map is relational to the z-probe and offset by the physical offset of the probe. If this is correct, then would it not stand to reason that if i set the initial extruder height (to just allow a bit of paper to slide under) then do the bed auto-level, that the initial height would be corrected over the entire bed? Also, if the initial layer height in my slicer is set to .3, would the initial layer height not actually be .3 (+the thickness of the paper)? Am i missing the mark here? 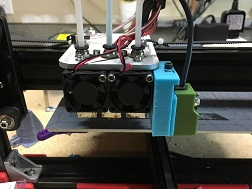 Here is a pic of the hot end with the 2 outside nozzles removed) initially i was using the far right extruder as #1 but was losing a bit of printable bed size and I am actually needing to be very close to the edges to print a few larger items. I am considering getting longer aluminum extrusions so all 3 nozzles with have the ability to print to all 4 extremes on the bed.